The Camelot Edge Profile is exclusively available on Grothouse custom solid wood surfaces. The name “Camelot” is most commonly known as a castle and court associated with King Arthur. 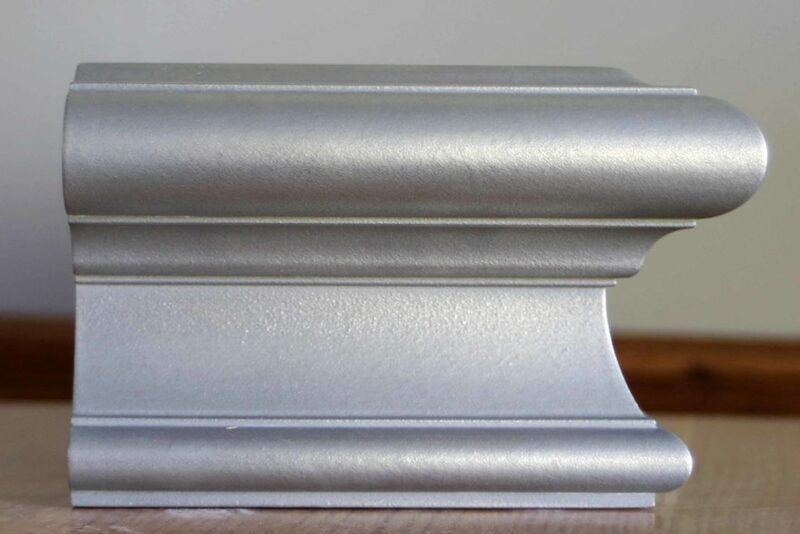 This edge profile features strong details and elegant curves, much like the architecture of the Camelot castle. And thus, the edge profile was named the Camelot. A countertop must be at least 3 3/4 inches thick to feature the Camelot edge. A large overhang is required because of edge projection. This edge also features a large inside radius. The edge can be applied to wood countertops crafted in edge grain and end grain construction style. Flat grain construction with applied edges can be done, but is not recommended as it would be unusual at that thickness. This edge cannot be added to a composite substrate. A wood countertop with the Camelot edge can be crafted in any of our 60+ wood species. 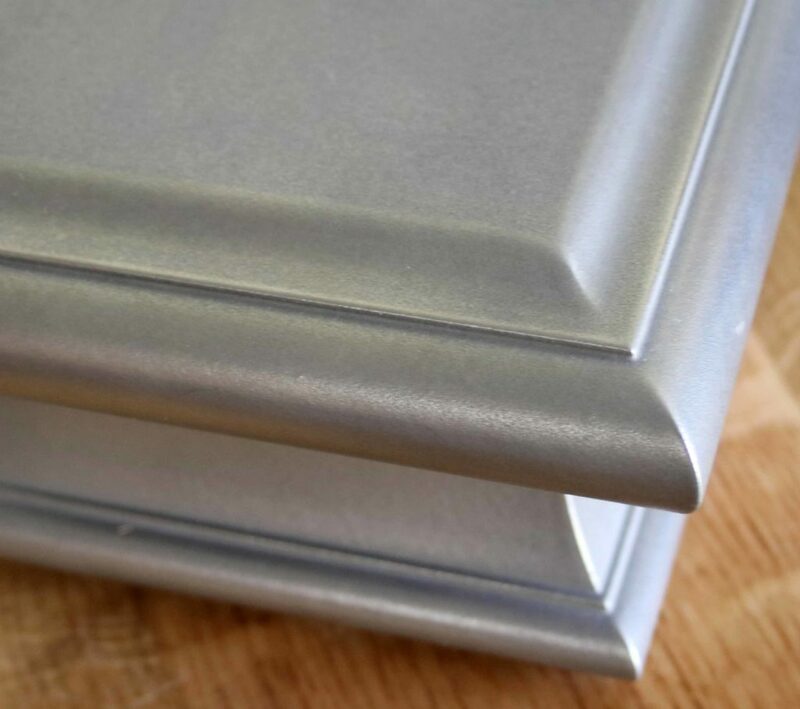 It can also be coated in any of our Anvil™ metal finishes. Any of our custom features and options can also be applied to a countertop with a Camelot edge. The Camelot edge profile photograph featured in this blog is a sample crafted out of Hard Maple wood in edge grain construction style. The wood is coated in the Anvil™ Axel metal finish. The sample is a 3 3/4 inches thick. 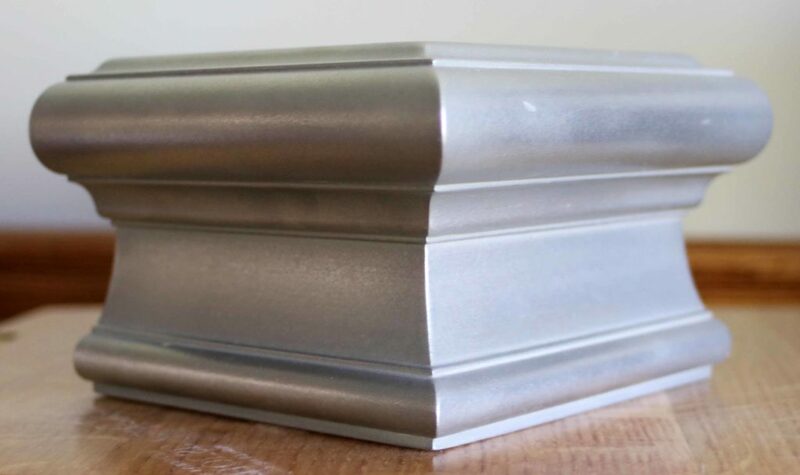 This sample is a part of our Anvil™ Metal Sample Kit for Grothouse Dealers. If you are interested in becoming an Anvil™ Grothouse Dealer and purchasing the kit, contact us at glumber@glumber.com. You can view more edge profiles available for Grothouse wood surfaces by visiting this page on our website. Visit the Countertop Image Library to see designs featuring wood surfaces with the Camelot edge profile. The Medium Double Roman Ogee is an impressive, top-rated Wood Countertop Edge Profile. It is a popular edge chosen for surfaces used in Traditional and Transitional style kitchens and baths. The Medium Double Roman Ogee requires a minimum countertop thickness of 2-1/2″. 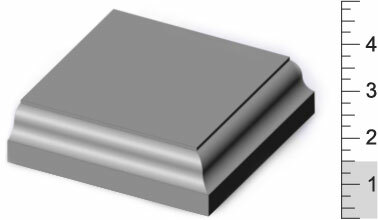 The depth of the edge profile is 2-1/8″. Below is a diagram of the edge profile. It can be applied to a wood surface of any construction style: Flat Grain, End Grain, and Edge Grain. However, it can only be placed on the top of the countertop edge. Below are several different designs including Wood Countertops with a Medium Double Roman Ogee edge. 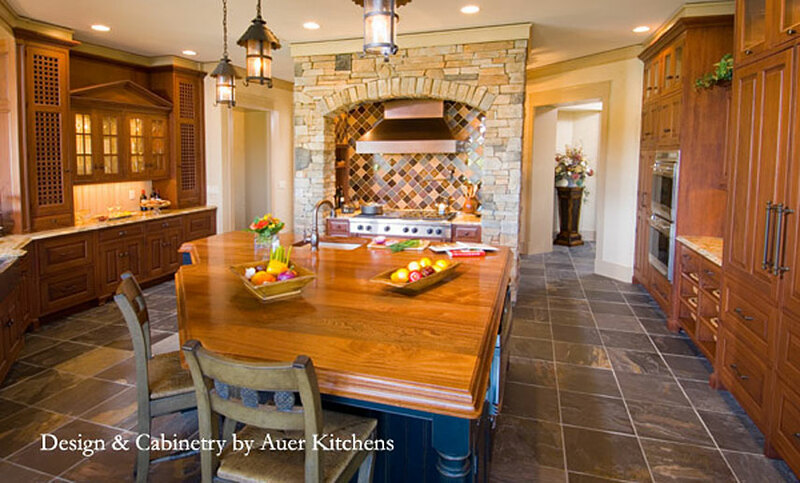 The Traditional style kitchen pictured above was designed by Auer Kitchens. 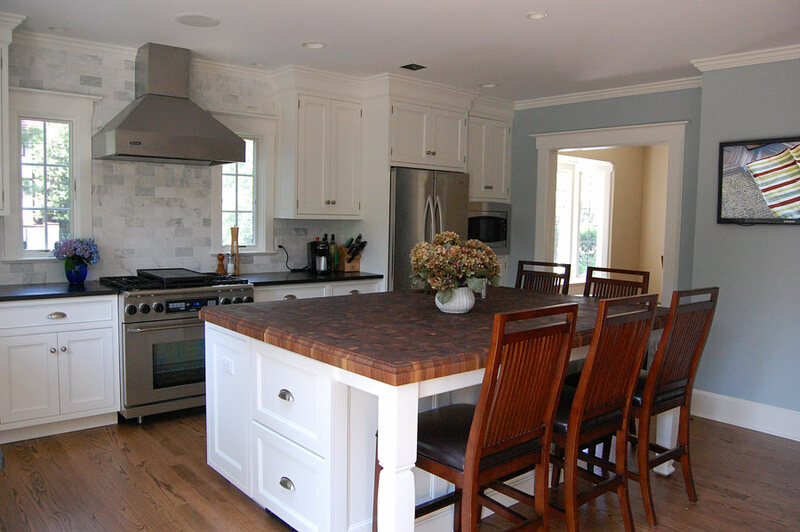 For the kitchen island they chose a Flat Grain Sapele Mahogany Wood Countertop. The countertop includes a Medium Double Roman Ogee Edge. 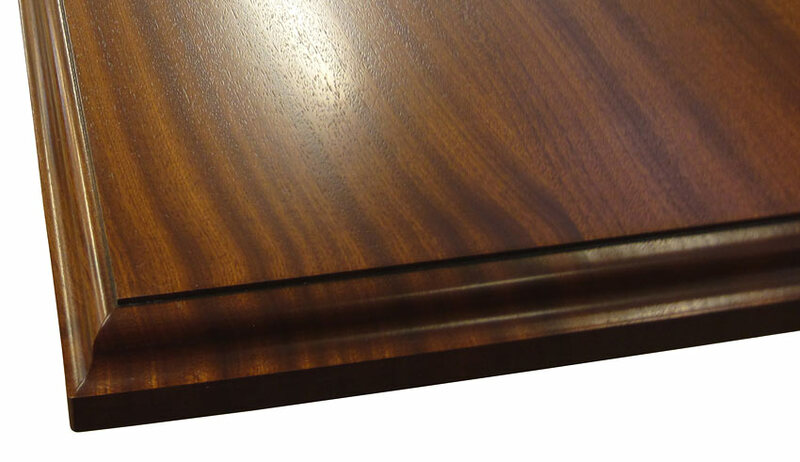 Pictured above is another Sapele Mahogany Countertop crafted in Edge Grain Construction. This countertop includes a Medium Roman Ogee for the edge profile. 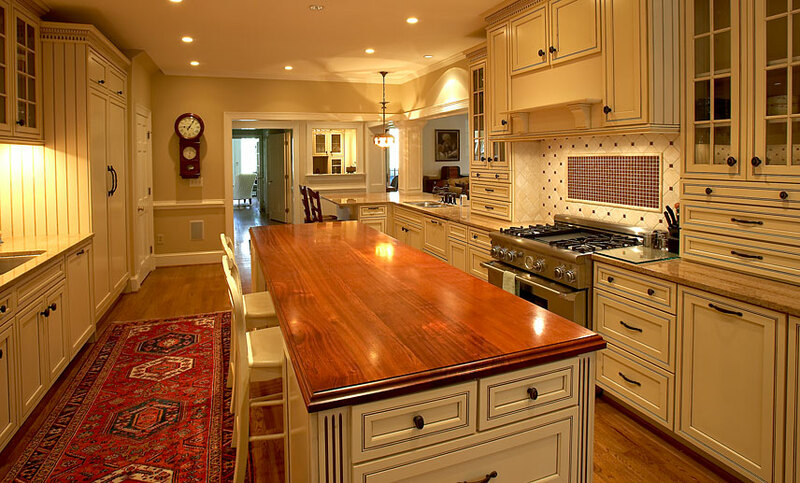 This Traditional style kitchen was designed by Steinburg Custom Designs. This next countertop is Walnut crafted in Edge Grain construction. The Walnut Countertop includes the Medium Double Roman Ogee, as well as two inset notched radius corners. This Walnut Countertop was designed by Kornerstone Kitchen & Bath. For more information about the Medium Double Roman Ogee Wood Countertop Edge, visit the Countertop Design Guide. To view more Wood Countertops with a Medium Double Roman Ogee, visit the Countertop Image Library. 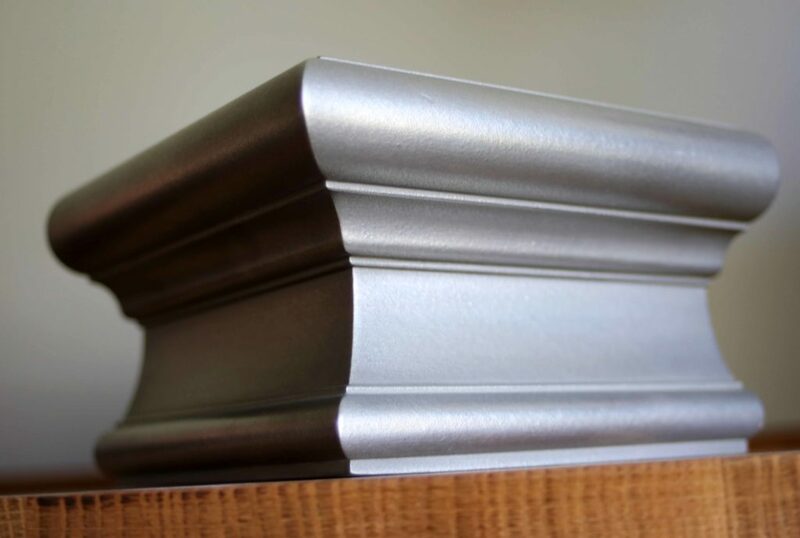 The Standard Roman Ogee is one of our most popular edge profiles. The elegant curves add charming detail. This classic edge compliments paneled cabinetry, which is commonly used in today’s kitchens. This edge requires a minimum countertop thickness of 1-1/2″. The depth is 1″. It can only be placed on the top of the countertop edge. 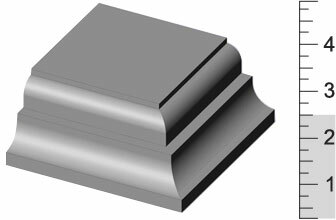 Typically the bottom edges and vertical corners have a 1/8 inch Roundover edge. The price level for this edge profile is Moderate. Any Construction Style can include the edge. Wood Countertops with the Standard Roman Ogee Edge are popular for Traditional and Transitional style kitchens and baths. American Black Walnut Butcher Block Countertop with Standard Roman Ogee Edge. This American Black Walnut Butcher Block Countertop features the Roman Ogee Edge. 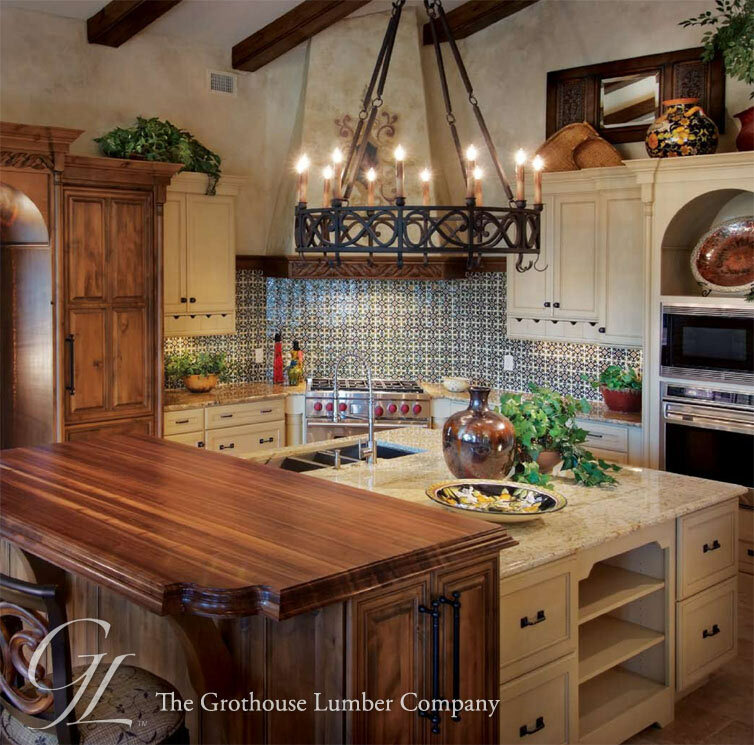 The Butcher Block carries out the traditional style in the kitchen from the countertop to the kitchen island columns. Sapele Mahogany Wood Counter with Standard Roman Ogee Edge. 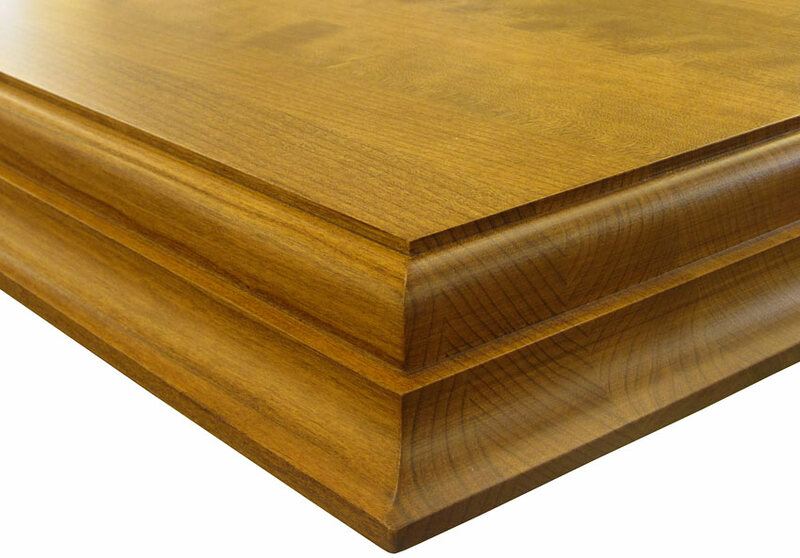 The above Sapele Mahogany Flat Grain Wood Counter has the Roman Ogee Edge. 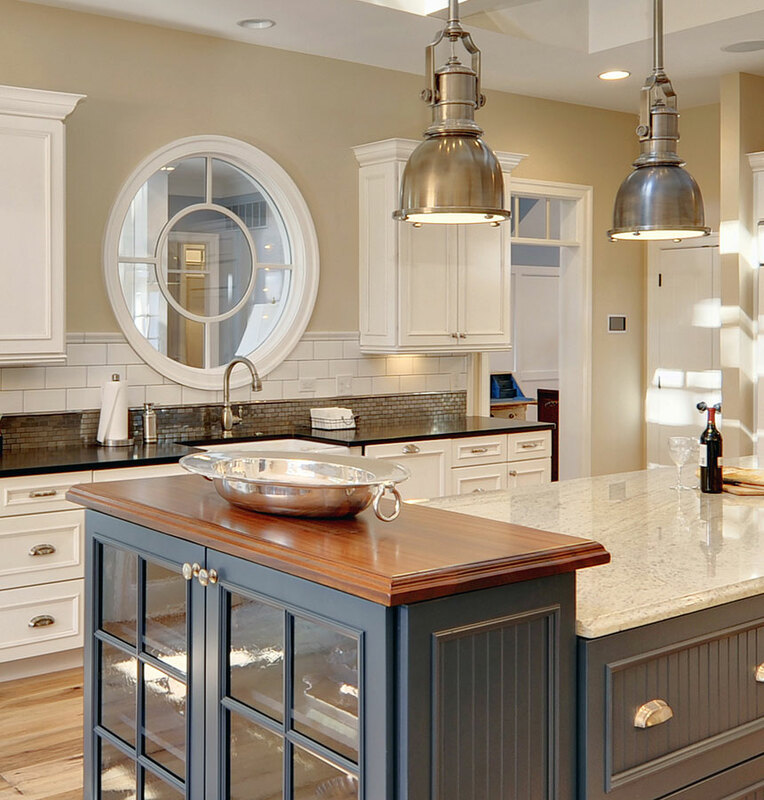 It creates a timeless, traditional appearance for this kitchen island end. Wood-Mode designed this traditional Saxon Wood™ Flat Grain Counter to include the Roman Ogee Edge. Saxon Wood™ is the first of a series of specially curated woods, hand selected and sourced by Paul Grothouse. The edge connects the wood counter with the traditional style of the rest of the space. This Flat Grain Brazilian Cherry Wood Counter the edge. The first place you look when viewing this image is the kitchen island. 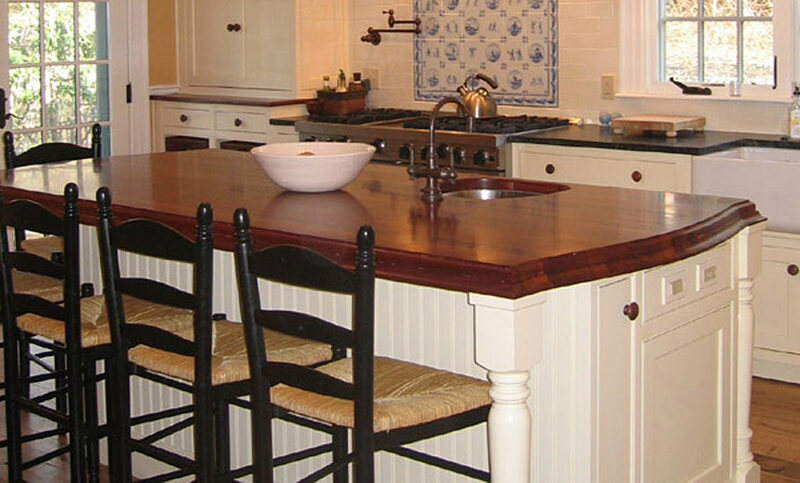 The beautiful color of the Brazilian Cherry and the decorative edge pull the kitchen together to meet in the middle. 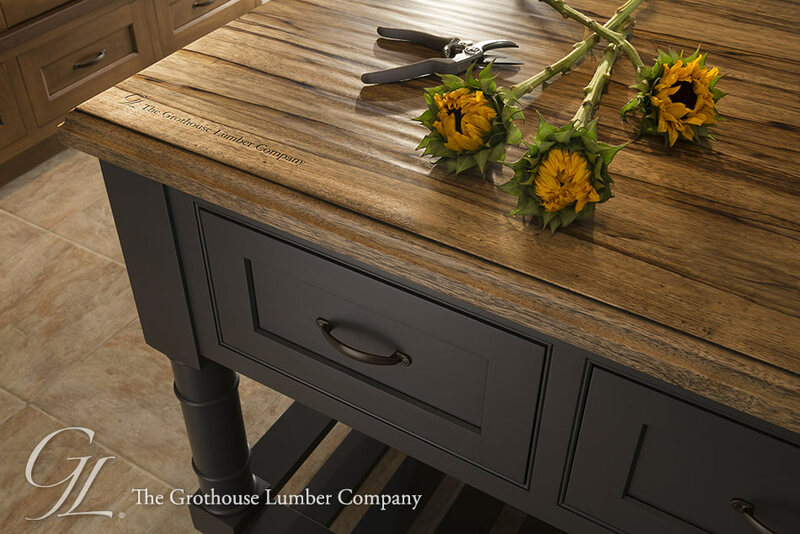 The Cabinetry Kitchen & Bath Design Studio wrote a blog about a Grothouse Peruvian Walnut Wood Countertop. The Wood Countertop is pictured above, showing off the edge. 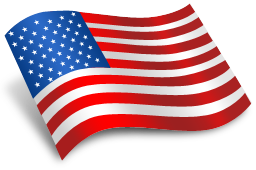 Click here to read the blog. 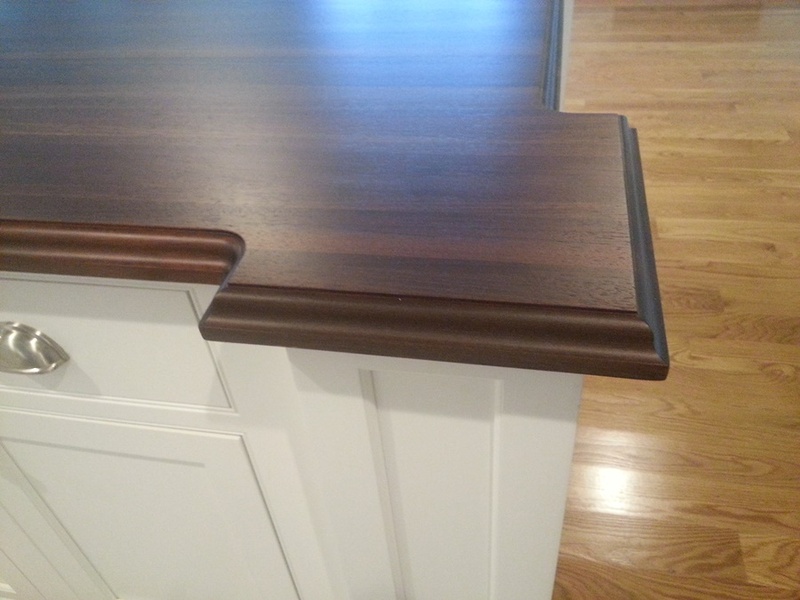 More Wood Countertop Edge Profiles can be found in the Countertop Design Guide. To view more Wood Countertops with Standard Roman Ogee Edges, visit the Countertop Image Library.